By the end of 2016, more than 230 million Chinese were older than 60, according to the Ministry of Civil Affairs. The government predicts the country's elderly will account for about 25 percent of the population by 2030. 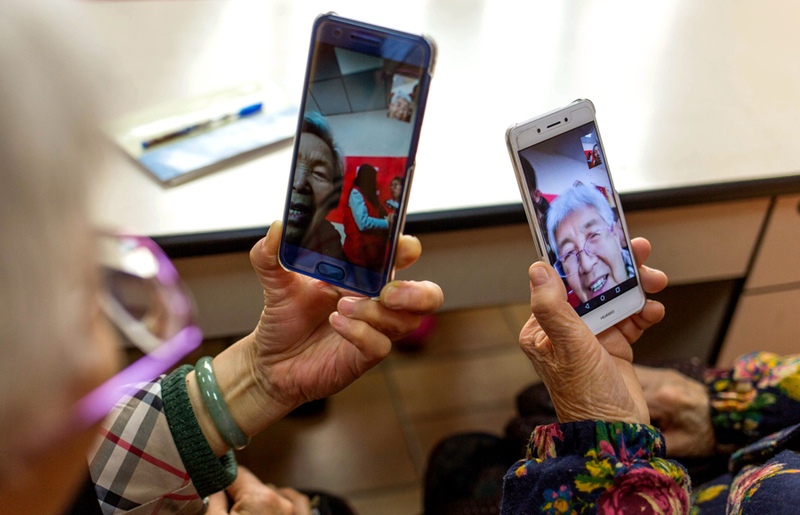 In an era of information accessibility, many elderly people are beginning to explore the internet to enrich their lives, with 98.5 percent using Tencent's WeChat messaging app. About 70 percent make videos to share online, 40 percent use the internet to pay mobile phone bills and 30 percent shop online, according to a report by Tencent and the Chinese Academy of Social Sciences. Many also know how to give money in virtual red envelopes－or hongbao－via WeChat. "I had a video chat with my grandson yesterday," said Pan Xuelan, 60. "He looked fatter than last time." Pan's daughter bought her a smartphone and taught her how to use WeChat. "I chat with my family every week on WeChat," Pan said. "The internet truly makes life easier." Elderly WeChat users have even created a series of special emojis, featuring various big characters and extremely bright colors. A report by Tencent said they are usually filled with "positive energy". Such emojis, which carry traditional messages such as "Wish you every success!" and "Have a wonderful morning! ", are considered dated by many young people, but appeal to some due to their retro feel. "For every holiday, my mom sends me such emojis," said Chen Xiaojie, a teacher in Beijing. "For example, for New Year's Day, she sent me a spinning emoji with the Chinese characters for happy holidays." For the National Day holiday in October, she sent him an emoji containing a shiny character for the motherland, followed by two dancing characters saying "long life". Chen added that many elderly love the idea of sharing articles about health and traditional Chinese medicine as well as "chicken soup for the soul" with friends on WeChat. For others, like 67-year-old retiree Yin Yuzhen, using internet tools helps make life much easier. Yin and her husband live on the fourth floor of a building in Beijing that has no elevator. "Shopping for heavy items like cooking oil and staple foodstuffs such as rice and flour used to be a big headache," she said. "Now we have delivery of such things to our doorstep, sparing us from that trouble." When going out, Yin usually books a car service via an app on the smartphone her son gave her two years ago as a birthday gift. "Nowadays, we cannot live without the internet and the mobile phone, particularly when our son is far away from us," she said. However, every coin has two sides. As many elderly become more interested in the internet, some of their children have expressed concern. "My father is addicted to surfing the internet these days," Jiang's daughter said. "His eyesight is not every good, and I worry that replying to messages on the singing platform will be bad for his health." Liu Jun, an office clerk in Wuhan, Hubei province, also expressed concern about the health effects of her 68-year-old father's "internet addiction". She said he stays online for an average of four hours a day, and that meant "he doesn't go out and engage in physical exercise as before, which might not be good for his health". Zhao Jie, a business professor at Anhui University who has conducted research on the use of micro blogs, said the need for emotional communication and socializing prompted many elderly to explore the internet. Those aged 50 or older comprise more than 10% of the online population, making them a growing force in cyberspace.